"Beauty and the Beast" with inclusive session in O’Porto. 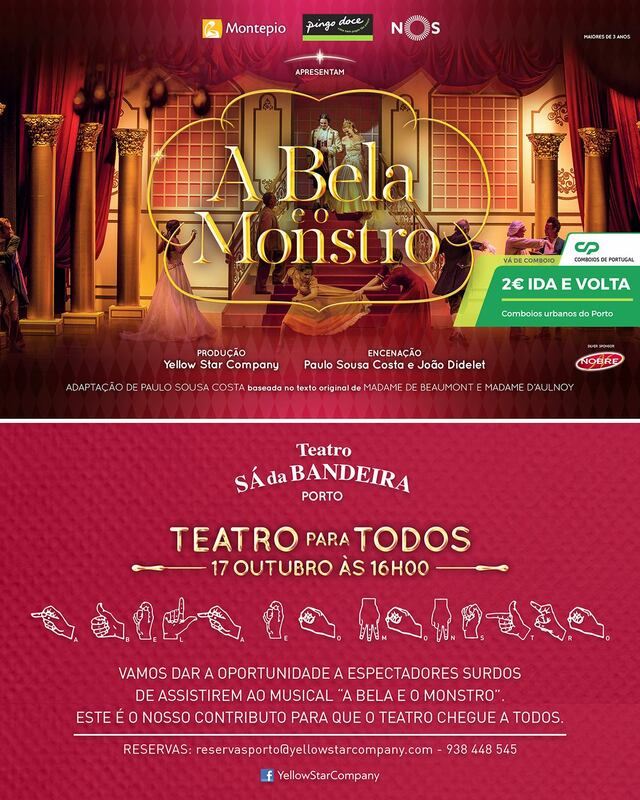 Tomorrow, Saturday the 17th at 16:00 in Sá da Bandeira Theater , will hold up an inclusive session of the play “Beauty and the Beast.” This will be translated into Portuguese Sign Language. The initiative is the Yelow Star company, which again leads to stage a comprehensive session for deaf people, this time at the Sá da Bandeira Theater in Porto. The text of adaptation is the responsibility of Paulo Sousa Costa. The scenario is the responsibility of Paulo Sousa Costa and João Didlet. “Once upon a time … a prince who lived in a palace surrounded of red roses, ultimate symbol of the Kingdom of roses and rare wealth in the contiguous kingdoms. The prince, who was known to be very bad, lazy and extremely vain, lived indifferent to the beauty and purity of roses. Was concerned only with its own beauty and having more and more gold. Taking advantage of the absence of his father, the King, he sold tons of roses to neighboring kingdoms, which did not have the luck to see grow on their land so special wealth. One day, the protective fairy roses fearing that they would end the kingdom, put a curse the prince turning him into a monster and all the roses of the kingdom were black, sadness symbol, so that he could no longer sell. ‹ PreviousWaves for All in Vila do Conde. Next ›“A Bela e o Monstro” com sessão inclusiva no Porto.